Last week I asked: is the bull exhausted? The answer seems to be a resounding no. The S&P 500 has burst into new highs already, so it looks like its quick pullback to 1925 is all we can get as far as ‘corrections’ go in the current environment. The round number 2000, which would be a major milestone for the S&P, is looming large and becomes a magical attractor at this point. It could be reached sooner rather than later. The S&P 500 has broken out of a rising wedge twice, and to the upside! So much for rising wedges being bearish. It has successfully retested the most recent breakout and marched on to higher highs. That’s as convincing as it gets. That doesn’t mean this move cannot fail anymore at this point, but smart investors go with what they see and change their mind when the situation changes. Right now this market is telling us it still wants to go higher. Technically the picture has improved as well. My short term Earl indicator has made a shallow bottom and is going up again. 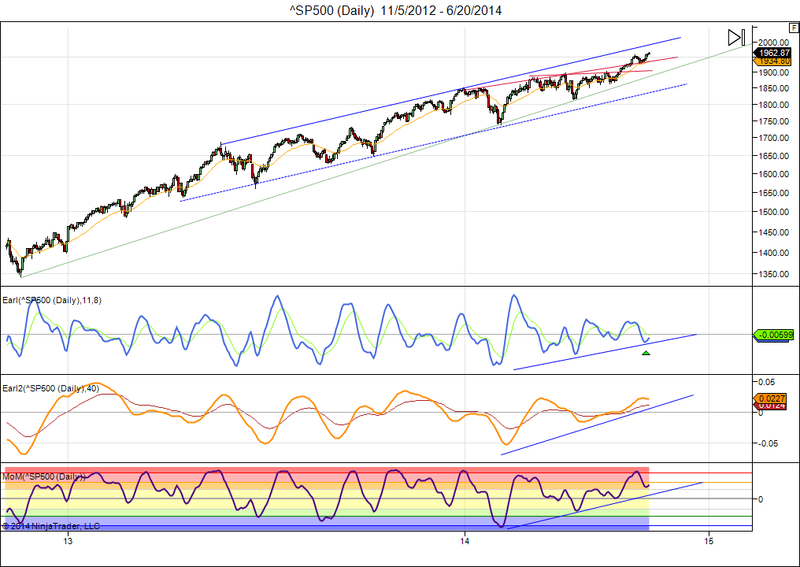 The slower Earl2 is rather neutral sideways, could push for another high. With another week of lunar green period to go it looks pretty good. Looking at the trend lines, the S&P 500 has room to rise until 2000-2050, where overhead resistance from long term trend channel would be met. The 1900 level is now major support, a drop back below that level would prove the recent breakout false. The Chinese stock market has been grinding down for years, much like it did in 2001-2005. 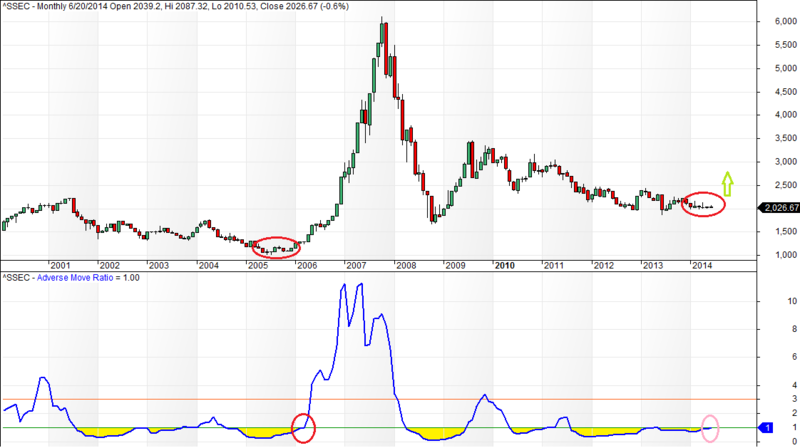 In recent months the SSEC has been printing very small candles while flatlining, just like it did in late 2005. This suggests that selling has dried up. And the adverse move ratio is climbing back above 1, signalling the start of a bullish phase. That doesn’t mean we will get another rampant bull market like China experienced in 2006-07, but a climb to 4000 is easily possible. Based on my weekly key reversal levels, the Chinese market will effectively turn bullish on a weekly close above 2079. This entry was posted on June 23, 2014 at 6:32 am	and is filed under Financial Astrology, Market Commentary. Tagged: China, lunar cycles. You can follow any responses to this entry through the RSS 2.0 feed. You can leave a response, or trackback from your own site.